The holidays are upon us and that means it is the season for parties, family get-togethers, and making memories. There will inevitably be photographs and keepsakes from these events, and you may at some point consider gathering them together in a photo album or scrapbook. Before you begin, however, let us take a look at some historical examples so that you can avoid the mistakes of our scrapbooking-forebears. Duke, like many research libraries, holds a large number of scrapbooks and photo albums across our collections. 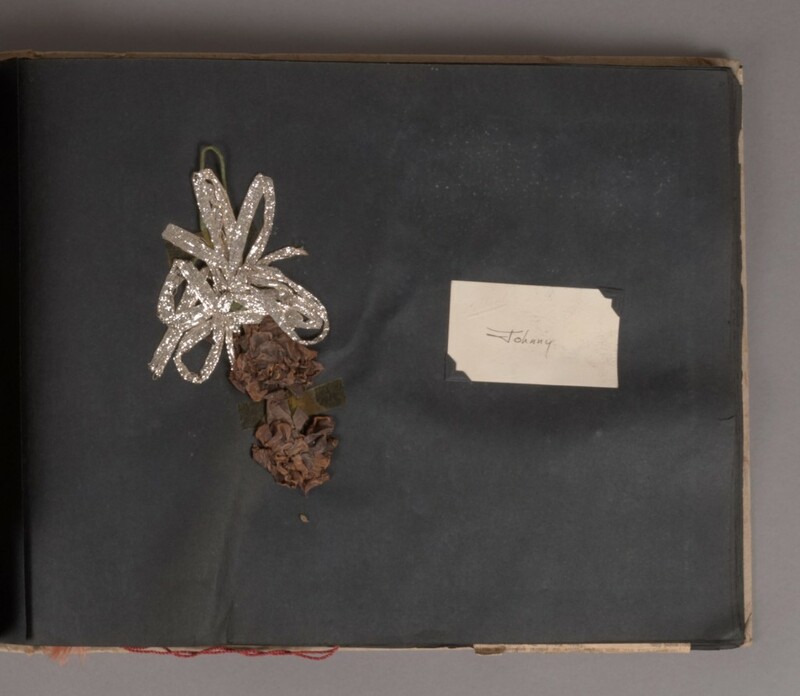 Scrapbooks are complex objects and they frequently come to the conservation lab to address inherent problems with the materials or housing issues. Usually, we find some pretty strange objects inside as well. A student scrapbook from the 1940s recently arrived in the lab which perfectly illustrates five common and problematic conditions. There are so many varieties of pressure sensitive tape and, because it is a very convenient way to attach materials to pages, we encounter it all the time on collection material. Unfortunately, adhesive tapes do not age well and can exhibit a number of problems, such as discoloration, adhesive creep, or even adhesive failure. 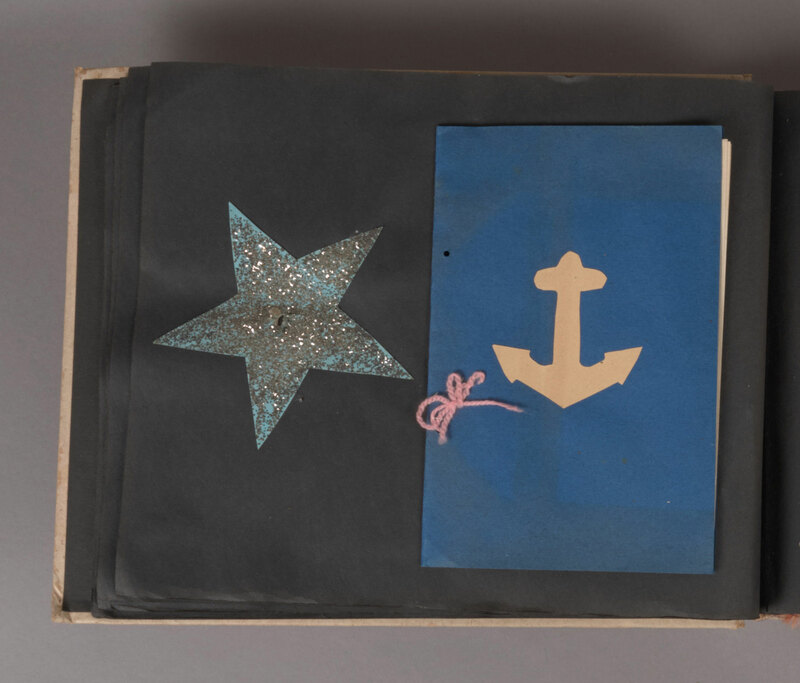 Tape can stain the items it touches (like the white tabs on the felt flag above) or cause pages to stick together. A better option is to use a simple and reversible attachment method, such as photo corners. Stable plastics such as polyester, polyethylene, or polypropylene are preferred. This one is more social etiquette than preservation practice: When you add glitter to your scrapbook, you give the gift of glitter to every person who looks at your scrapbook until the end of time. It is literally all over my bench as I write this. This was once a flower. Flowers and candy may hold many memories, but they are not so compatible with scrapbooks. Like tape, perishables can either discolor the pages and items around them or adhere pages together. 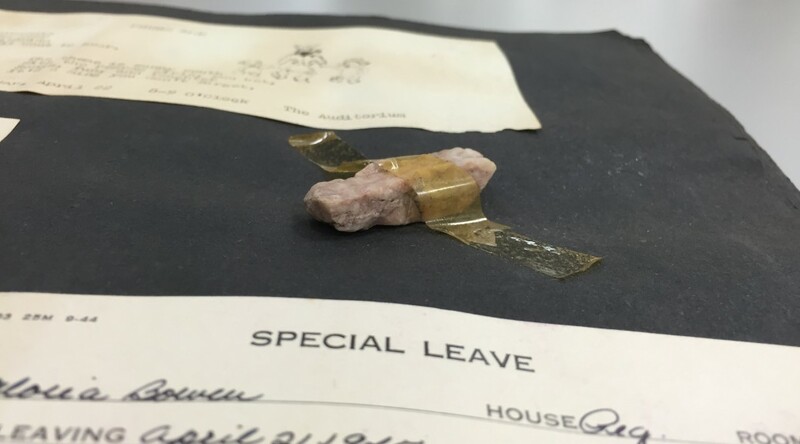 These items may also be attractive to insects or mold, potentially compromising the entire scrapbook and putting other items in the collection at risk. Photographs of the flowers will function a little better in the book. Strangely, tobacco products, like cigars or cigarettes are also commonplace in historic scrapbooks. Use of tobacco products in general seems to be declining, so maybe we will stop seeing this in more modern scrapbooks that come into our collection. If the urge does strike you, however, I would suggest just including the wrapper or packaging (like the Lucky Strikes on the left, above), rather than an entire cigar (as on the right). Yep, that’s a rock taped to a page. Books are not the best containers for three-dimensional objects. In addition to distorting the entire book, pointy objects can pierce through facing pages and damage the attached photographs or ephemera. Heavier objects can even tear support pages from the book. Objects like this will be much happier in a box. A whole newspaper tucked inside and actually in remarkable shape for its age. In a similar vein, larger format pages, such as whole newspapers or large posters, may not survive well when folded up and tucked inside a scrapbook. The bulk of the folded piece can strain the scrapbook binding. Some papers become very brittle as they age and may crack along the folds- especially as they are unfolded and refolded with use. These items are better left out of the book and stored flat. Scrapbooks can be important cultural artifacts. I hope that in this digital age people continue to make them and that they will eventually make their way into library and archives collections. But I also hope that they do not contain so much tape. Previous PostBack to the Drawing Board, or “Tube Cap, Part 1”Next PostTube Caps Part II: Adventures in Cutting! 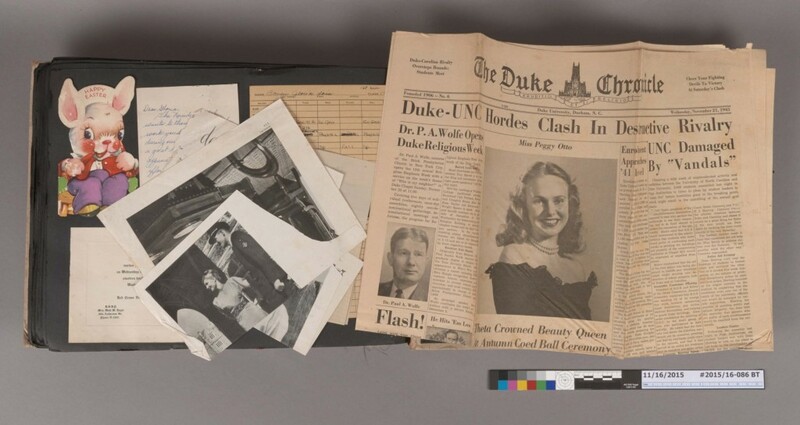 Duke has some remarkable scrapbooks, which I had the pleasure of examining while writing _Writing with Scissors: American Scrapbooks from the Civil War to the Harlem Renaissance_ (Oxford UP, 2013). 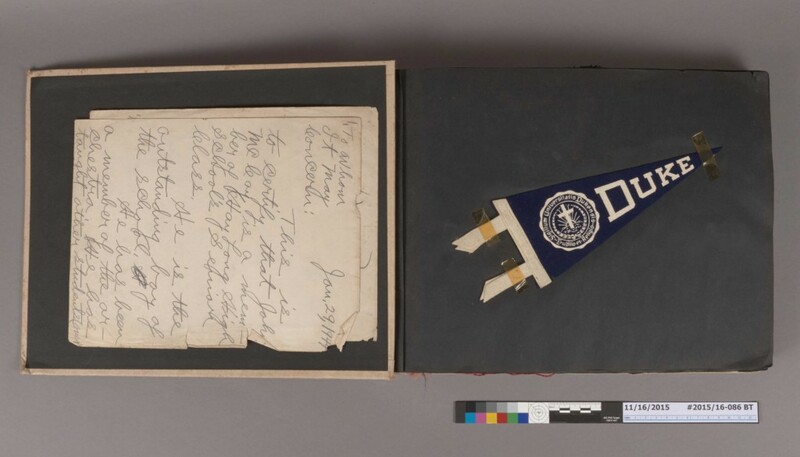 They include a Confederate household’s 400+ page scrapbook kept during the Civil War, tracking their shirts in ideas about enslaved people’s allegiance to their owners, among other things. There’s much more to examine! Thanks for the comment – Your book is an excellent resource! Sorry, that should be *shifts* in ideas, not shirts. The Confederates didn’t paste any shirts in — cloth was in short supply! One of the turn of the century men’s scrapbooks at Amherst College does contain a scarf (and sunglasses, and hairpins) though!